Gilwell Park will be active this October for the Jamboree on the Internet from midnight on Friday the 14th October through until 16:00 local time (15:00 GMT) on Sunday the 16th, with an extensive computer network for our visitors to enjoy. Similarly to the JOTA, the Jamboree-On-The-Internet connects Scouts using Internet techniques. Volunteer organizations like Scoutlink and ScoutNet provide the necessary technical support and server capacity. The JOTI is held on the same weekend as the Jamboree-On-the-Air. Units can choose to take part in either one event or both. 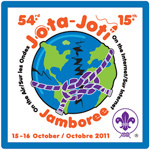 The JOTA and JOTI are world-wide events which bring together each year more that 500 000 Scouts and Guides. During the weekend, units may normally participate for 48 hours or any part thereof, from Saturday 00:00 h until Sunday 24:00 h local time. Both JOTA and JOTI are WOSM events to which members of the World Association of Girl Guides and Girl Scouts (WAGGGS) are kindly invited to take part and enjoy the international atmosphere together with the Scouts. The JOTA-JOTI is the only event offering to each individual Scout the experience that he or she really belongs to a world-wide movement. The World Scout Jamboree On The Internet (JOTI) is an international Scout Meeting on the Internet which takes places every year on the third weekend of October. This is an official event of the World Organization of the Scout Movement. Since 1996, JOTI is an official WOSM event and has a permanent place on the Web Site of the World Scout Bureau. To get the full text of the World Scout Bureau's Memorandum on this year's edition of JOTI (2011), click here. If we've raised your interest, just get a few suggestions from the official web site and participate in this year's JOTI.